Like we’ve said before, by global standards Calgary has a spectacular water supply– clean, safe and plentiful. The high mineral content, however, is problematic for most water handling surfaces and equipment. If you lack a water softener, or have only recently added one, you likely have hard water deposits to contend with. These are a chore to clean, especially with soapy residue added to the mix. There are some excellent cleaning products on the market designed to combat Calcium, Lime and Rust, but we won’t mention any brand names. These products are very effective, and very safe to use (provided you wear gloves and ensure the cleaned surface is well rinsed). The downside of these products is their high cost. One TV commercial that’s worth a chuckle shows someone clearing up a lime-encrusted shower head by dipping it in a big glass bowl filled with their product; what the commercial doesn’t tell you is the contents of that bowl equals two or three bottles of the product, at ten or eleven dollars per bottle. Because hard water stains are alkaline deposits of calcium and magnesium, acidic solutions will tend to dissolve them. The commercial products for cleaning limescale work fast (and require gloves) because of the strength of the solution; they usually contain strong acids. Weaker acids can still do the job given more time. With inexpensive materials like vinegar (acetic acid) or lemon juice (citric acid) you can get the same results with a little bit of patience. 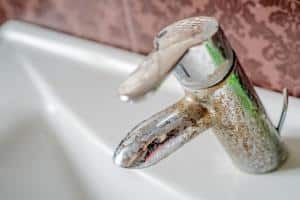 If you have scaly deposits on your chrome fixtures, try soaking some rags in white vinegar, wrapping the wet rags around the fixtures, and waiting for an hour or so. You will find the scale will wipe away easily. Note– don’t try this with iron or nickel fixtures, as they will break down when soaked in vinegar. This trick can also help a toilet bowl with hard water deposits– turn off the water supply and flush the bowl empty, then line the bowl with rags and soak the surfaces with white vinegar. Over the course of a few hours, even severe staining can resolve this way. Just make sure to flush and rinse the bowl thoroughly before following up with any other cleaner– toilet bowl cleaners often contain bleach. For glass or tile surfaces, a mixture of vinegar and water works well. Adding a little bit of lemon juice will improve effectiveness as well as the odour of the mixture. You will find it even more effective if warmed in the microwave to above room temperature. Use a sprayer to mist this onto the surface and allow it to sit for a few minutes, then rinse with a squeegee. This 50/50 vinegar and water solution is also effective for soaking scaly glasses and dishes; remember that the chemical reaction occurs faster at higher temperatures, so warm it up. One tricky thing about the topic of alternative cleaning methods is people getting too creative and blending cleaners. Before you get carried away with becoming a household chemist, check yourself! A good, general rule of thumb to remember is never mix bleach (or a product that contains bleach) with any other cleaning product. To be on the safe side, the only thing you should ever mix with bleach is water. Mixing bleach with acidic substances (like vinegar) or caustic substances (like ammonia in window cleaners) can produce poisonous gases such as chlorine, chloramine and chloroform. In particular, the combination of bleach and ammonia in an enclosed space like a bathroom can easily kill you. With that in mind, always read the cautionary labels on commercial cleaning products. When using household materials as alternatives, keep things simple, and never mix with bleach. It’s no wonder at all why people with water softeners swear by them– they don’t have to deal with this stuff! PREV: Water Softening: Right For You?